Photo by Phil Sears. Pastor Amanda Nickles shares a goodwill voucher with Earl Newbon at Grace Mission. 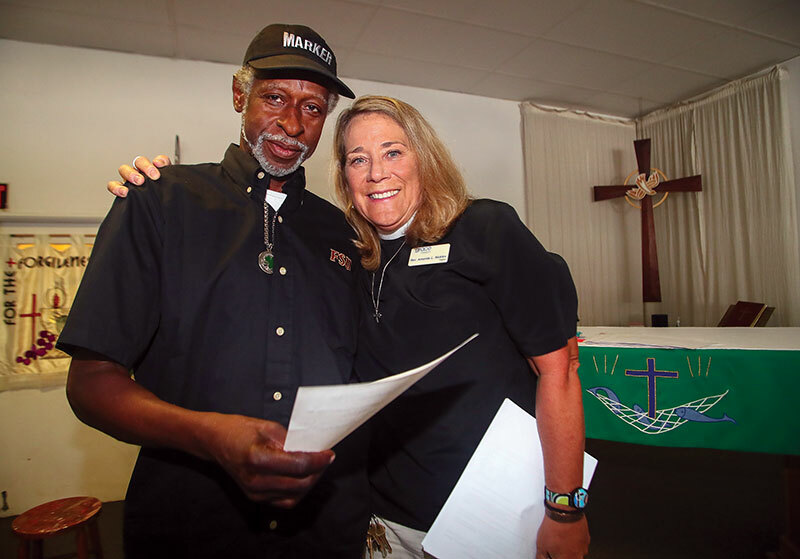 Established by the Episcopal Diocese of Florida 21 years ago, Grace Mission offers a church home — and some of the comforts of home — to the community’s disenfranchised. All its parishioners are poor, some are addicts, most are homeless. A 22,000-square-foot commercial building at the corner of North Bronough and West Brevard streets houses the church sanctuary, offices and dining hall — which will serve more than 40,000 free meals this year — as well as facilities not usually associated with houses of worship, including showers, a laundry room, and rooms full of donated clothing and toiletries free for the taking. “Everything we do here is free. We don’t charge for anything, ever,” said Amanda Nickles, who is starting her eighth year as pastor at Grace. And she feels fine if people are only listening to her sermons during services because there’s air-conditioning and a free meal afterward. Her faithful are able to repay these gifts with trust and honest conversation — and by healing. Another major effort for Grace Mission is its year-round children’s program. During the school year, it provides an academically based after-school program for about 25 first- through fifth-graders who live nearby in the Springfield Apartments, part of the Tallahassee Housing Authority. In the summer, there’s a week-long reading academy and an opportunity to sleep away at Camp Weed, an Episcopal summer camp in Live Oak. Three days a week, the academic program picks up children from Riley Elementary School and delivers them to the Episcopal University Center for one-on-one tutoring provided by local college students, chapel on Wednesdays, and creative free play. They are fed a hot dinner and then delivered by bus to their front door. The Christmas season is special throughout the mission. Church members are invited to give back by writing letters to Santa, which are then delivered to Macy’s. The store makes a $1 donation to the Make a Wish Foundation for every letter written and this year’s goal, Nickles said, is 2,000 letters. They are also encouraged to reach out to their families by writing Christmas cards to family members, even if they are estranged. Grace Mission’s Christmas service attracts upwards of 200 people and is followed by a dinner where worshipers are seated and served a traditional holiday meal at festively decorated tables. “The laughter and the joy that you see in people’s faces … that’s really nice,” she said. The youngsters have their own family night, which includes a service at St. John’s Episcopal Church, followed by a plated dinner. The event ends with each child being presented with a large, black bag full of wrapped gifts, chosen especially for them.